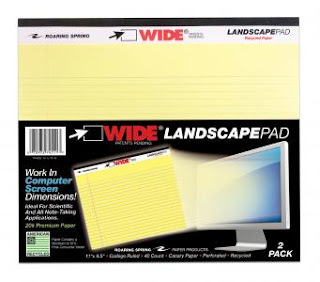 One of the largest independently owned producers of school and office supplies in America! Our sugarcane paper uses less energy and water than it takes to recycle old paper. Produced from the residue of the sugarcane crop, our sugarcane paper boasts a quality, brightness, and writing ease that exceeds traditionally recycled paper every time. Sugarcane fiber is waste material from the sugarcane refining process. This waste material is then used as pulp to produce fine paper. The result is a smooth, bright sheet produced at very green paper mills. We produce sugarcane items in both white and canary options. My husband is a paper engineer and anything paper related just excites him! He had never heard of Sugarcane fiber paper. I am super excited about the quality of this paper, much smoother than traditional recycled paper. They sell these notebooks in 1, 3, or 5 subjects. Perfect for back to school, and planning for work at home moms. I am still very much a paper person, even with all that we can do on the computer. Wide Landscape Pads is another product that Roaring Springs produces that I was really excited about it. Do you ever feel the need to have your paper turned sideways, or to be able to write in a landscape fashion? I do often, and the kids do when they are young and just learning to write. They come in a variety of sizes. We are getting used to paper being wider with the use of computers all of the time. It is nice to have a recycled paper notebook like this one. Roaring Springs is generously giving my readers a Prize Package of Back to School Notebooks!! 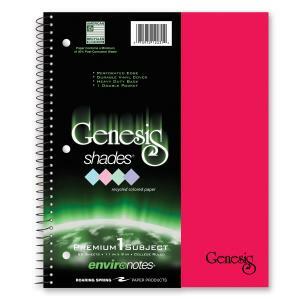 You get a 1, 3, and 5 subject Genesis Notebook as well as a White Landscape Pad!! I had no idea that paper could be made from animal poo!!! Very interesting. I learned that my love of all things paper has a limit! Although I did get a kick out of the Poo Paper counter displays! I learned that "Roaring Spring supplies products produced with different sustainable papers. These included recycled papers, sugarcane fiber paper, and poo papers." they carry poo paper from elephants, cows, horses and donkey. I really like their plaid pencil cases. And it is so good to know that they are using recycled products and are eco-friendly. I like the huge variety of items that are available. They sell horse, elephant, and cow poo paper. Novel idea. I like the Drawing Pad W/Pocket! They make paper from animal poo. I really like Choosey Chicks Happiness Notebooks, very cute. Love writing so smooth "efficient" paper sounds great! They you sugarcane fiber to make paper. The elephant poo paper! Sounds like a cool product and love that it is environmentally friendly too. Who knew they made poo paper?!? Love the Earthtones One Subject Sugarcane Notebook! !